ADIDAS Z.N.E. FAST RELEASE HOODIE DESIGNED FOR THE CRUCIAL MOMENTS BEFORE COMPETITION. The adi..
ID HEAVY TERRY HOODIE A THICK COTTON SWEATSHIRT CUT FOR COMFORT. Cool weather calls for warm l..
MUST HAVES BADGE OF SPORT HOODIE A PULLOVER HOODIE WITH A CLASSIC DESIGN. Show your pride in t..
SQUADRA 17 JERSEY A SHORT SLEEVE SWEAT-WICKING JERSEY FOR TRAINING. Control the ball, control ..
Z.N.E HOODIE MESH A RIP-READY HOODIE BUILT FOR COMFORT. In the intense moments before competit..
ADIDAS Z.N.E. MESH PANTS PANTS BUILT FOR PREGAME COMFORT. Head in the game, mind on the next m..
ADIDAS Z.N.E. TAPERED PANTS PANTS BUILT FOR DISTRACTION-CUTTING COMFORT. The adidas Z.N.E. col..
ALPHASKIN SPORT LONG TIGHTS BODY-HUGGING LONG TIGHTS MADE FOR COOL, DRY COMFORT. Be ready for ..
ALPHASKIN SPORT+ LONG 3-STRIPES TIGHTS BODY-WRAPPING TIGHTS MADE FOR COOL, DRY COMFORT. Focus ..
CONDIVO 18 TRAINING PANTS SLIM-FIT TRACK BOTTOMS FOR SHARPENING YOUR SKILLS. Conquer the train..
CONDIVO 18 TWO-IN-ONE SHORTS SHORTS FOR COOL-WEATHER TRAINING. Keep the drills and practice go..
Condivo 18 Drop-Crotch Training Pants Your pitch, your rules. Cut for a slim fit, these men's foo..
ESSENTIALS 3-STRIPES PANTS FRENCH TERRY PANTS MADE FOR POST-WORKOUT RELAXING. Slip on sporty s..
Must Haves 3-Stripes Fleece Tiro Pants Comfort off the field. These pants have a cosy fleece buil..
MUST HAVES 3-STRIPES TIRO PANTS SOFT SLIM PANTS FOR RELAXING BETWEEN PRACTICES. Comfort off th..
MUST HAVES FRENCH TERRY BADGE OF SPORT PANTS TAPERED SWEAT PANTS FOR POST-GAME COMFORT. Find c..
TIRO 19 3/4 PANTS CROPPED PANTS THAT KEEP YOU COOL, DRY AND COMFORTABLE AS YOU TRAIN. Train ha..
TIRO 19 POLYESTER PANTS WARM-UP PANTS THAT KEEP YOU DRY AND COMFORTABLE. Stay ready for the ne..
TIRO 19 TRAINING SHORTS SHORTS THAT KEEP YOU COOL, DRY AND COMFORTABLE DURING TRAINING. Train ..
4KRFT SPORT ULTIMATE 9-INCH KNIT SHORTS SOFT SHORTS MADE FOR DRY, VENTILATED COMFORT. Add volu..
ALPHASKIN SPORT SHORT TIGHTS ANTI-ODOUR, VENTILATING SHORT TIGHTS WITH A SECOND-SKIN FEEL. You..
MUST HAVES BADGE OF SPORT SHORTS CASUAL SHORTS WITH SIGNATURE 3-STRIPES STYLE. Flash a clean l..
adidas Z.N.E. Shorts The adidas Z.N.E. collection was designed for the type of comfort that remov..
ADIDAS Z.N.E. TEE A COMFORTABLE UPGRADE TO A SPORTY ESSENTIAL. The adidas Z.N.E. collection wa..
Condivo 18 Cotton Polo Shirt Moves sweat away from your skin so you stay dry every step of the wa..
DESIGN 2 MOVE TEE A ROOMY TEE MADE TO MANAGE MOISTURE. Find your workout rhythm in this long s..
Essentials Plain Tee Step off the field and onto city sidewalks in a clean sporty look. A small c..
FREELIFT BADGE OF SPORT GRAPHIC TEE A MOISTURE-WICKING TEE MADE FOR EASY MOVEMENT. Train longe..
FREELIFT SPORT SOLID BADGE OF SPORT TEE A T-SHIRT THAT'S CUT TO MOVE AND BUILT TO KEEP YOU DRY. ..
ID STADIUM TEE A CREWNECK T-SHIRT WITH A CLASSIC LOOK AND COMFORTABLE FEEL. A low-key look for.. SPORT 2 STREET BASS LINE TEE A SLEEK T-SHIRT WITH A RELAXED FIT. Celebrate your victory after .. SPORT ID MESH SWEATER A SPORTY PULLOVER FOR EVERYDAY COMFORT. Showcase your loyalty. This swea..
TEE A COTTON TEE WITH A MINIMALIST LOGO LOOK. A clean design updates this everyday essential. .. THE PACK TEE A BOLD TEE ROOTED IN ADIDAS DNA. No boundaries, just possibilities. Ready for wha.. THE PACK TEE A CREWNECK T-SHIRT WITH A MINIMALIST DESIGN. 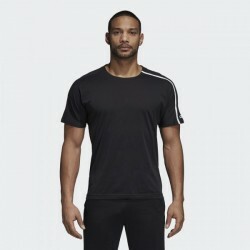 A fresh take on the classic cotton t..
ALPHASKIN SPORT TEE A BODY-HUGGING T-SHIRT THAT MANAGES MOISTURE. Face your workout head-on in..